Screen Capture from my latest work: a website for MKM Design. It’s been a little while since I posted, but there’s a good reason why. I’ve been working on building a website for a fellow designer, Ms. Mikelle Morrison, independent designer at MKM Design. Mikelle is a senior graphic and web designer who specializes in User Experience and Brand Design. She’s incredibly talented and was inspiring to work for, to say the least. As with many projects, seeing this one come to an end was bitter-sweet; on the one hand, I am thrilled to see the site launch and to have my client be happy with my work. On the other hand, I’ll miss our day to day interactions and collaboration. I do know, however, that Mikelle and I will stay in touch and talk often. I’m very grateful that our paths crossed and that we were able to work together. Also…If you happen to listen to podcasts that center around design, you can hear Mikelle on The Deeply Graphic Design Cast, a wildly popular podcast led by Wes McDowell of The Deep End design firm. I find myself relating, laughing and being inspired by the speakers and topics each time I listen. It’s great stuff! 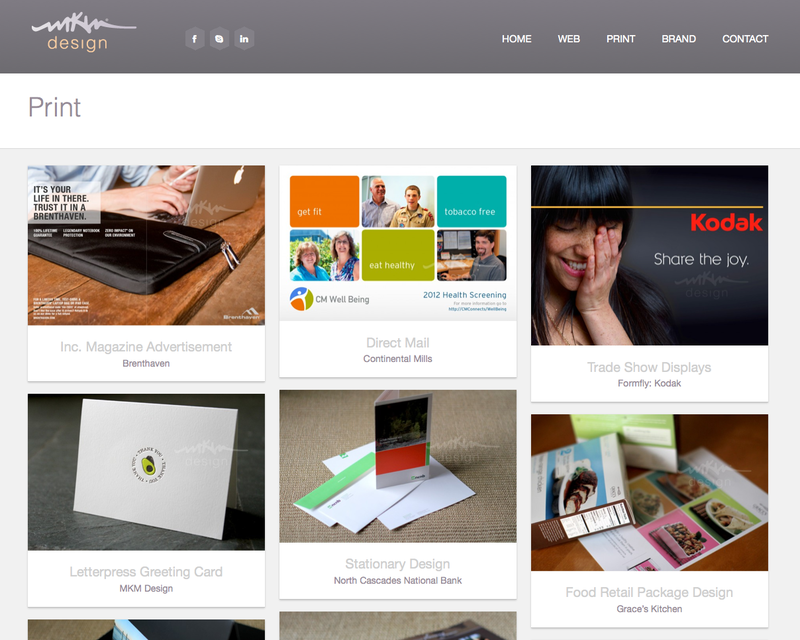 Below are screen shots of Mikelle’s homepage as well as a shot of her ‘Print’ portfolio page. The theme I started with was Wildfire from Themeforest. It’s been a great experience. I’m looking forward to many, many more. I was certainly not alone in making this project a success though. Mikelle gave amazing art direction and was a true team player. I also had an angel on my shoulder, Mrs. Lindsay Siegel Beckman of Stoke Interactive. Lindsay graduated from the same program I am currently in for my Masters Degree at Academy of Art University and has been guiding me in all areas of my career. We connected through the Alumni Association a couple of months ago and it’s been, as they say, history ever since. We strongly believe that every company has an opportunity to change the world. Every small detail makes a difference, which is why we are dedicated to putting extra time and love into helping others that otherwise might not have a chance. We embrace the stories of your how your non-profit or company is bettering the world. It’s all about working together toward a common goal; a better tomorrow. You’ll be hearing a lot more about Stoke in my upcoming posts as I start to work on projects with them. To put it bluntly…I’m STOKED. Pun intended.